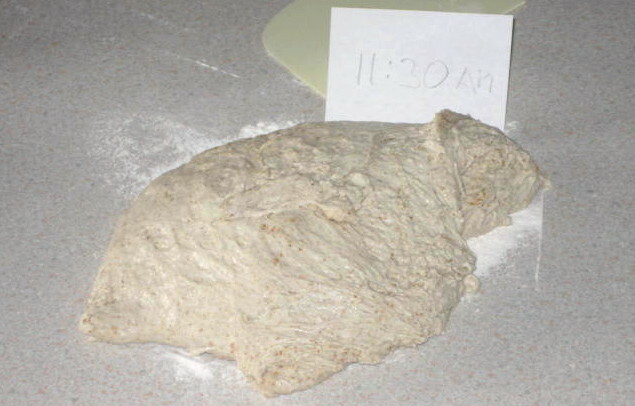 This version of No-Knead Bread is Jim Lahey’s original and revolutionary creation. I’m just passing it on. The secret ingredient in all true bread is time. The key to this addictive loaf of rich, hearty goodness is not laborious kneading; it’s an overnight rest. With time, water and flour naturally form elastic dough that rises with just a small amount of yeast. Here’s how to make your own artisan bread. 1. Whisk the dry ingredients together thoroughly. Add the water and stir until a wet dough forms. Continue stirring until the dough incorporates all the loose flour in the bowl, about 60 seconds in total. 2. Cover the bowl with a towel and rest in a warm place for 12 to 18 hours. It will double in size, bubble and long gluten strands will form. 3. Lightly flour your hands and the work surface then remove the dough from the bowl. Quickly form it into a ball. Thoroughly flour a cotton towel and rest the dough on it. Cover it with another floured cotton towel. You may also rest the dough on a non-stick ‘Silpat’ mat and cover it with just one towel. 4. Rest the dough a second time. In 2 to 3 hours it will rise again and double in size once more. 5. 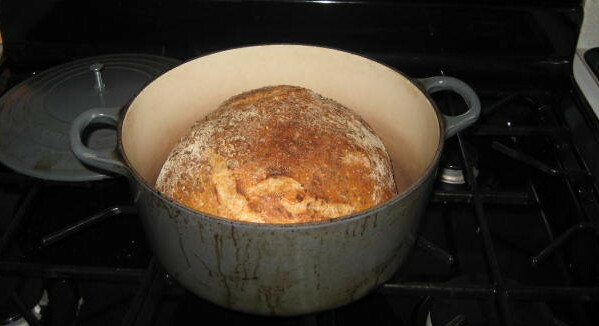 A half an hour or so before the dough is ready preheat your oven to 450 degree with a heavy covered pot in it. You may use cast-iron, steel, enamel or ceramic. 6. When the dough has fully risen, slide your hand under the towel and quickly invert the delicate dough into the hot pot. Shake the pot a bit to settle it then place the lid on the pot and start baking. 7. Bake for 40 minutes with the lid then remove it and bake for 15 minutes more. 8. When temperature inside bread reaches 210 °F the bread is done. When you remove it from pot you will hear the crust crackling. What a sound and what a smell!